Indian Industrial School, Halstead, Kansas, was established in 1885 jointly by the Mission Board of the General Conference Mennonite Church and the Halstead Seminary. The school was started with 15 Indian children from Oklahoma, who received regular training in schoolwork and agriculture, housekeeping, and Christian living. In 1887 the school was moved to the Christian Krehbiel farm about one mile southeast from Halstead. During the school year the children received regular instruction and during the summer they helped on the farm, where they lived as a large family. 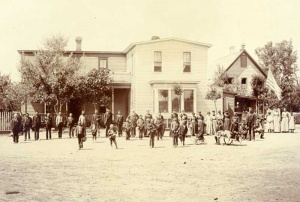 In his report to the Mission Board in 1892-1893 Christian Krehbiel stated that he had again received a contract from the government to take 30 pupils for the school year, for each of whom he would receive $125. In 1896 the government discontinued this contract policy of schools for the Indians. Thus after eleven years of operation the Indian Industrial School was closed. Both the Indians and the Mennonite constituency, which was aroused to greater mission efforts, gained by this enterprise. Reports were published in Christlicher Bundesbote. Kaufman, Ed. G. The Development of the Missionary and Philanthropic Interest Among the Mennonites of North America. Berne, IN, 1931: 141-143. Krehbiel, H. P. The history of the General Conference of the Mennonites of North America. Canton, Ohio? : The Author, 1898-1938: I, 306-309. Krahn, Cornelius. "Indian Industrial School (Halstead, Kansas, USA)." Global Anabaptist Mennonite Encyclopedia Online. 1958. Web. 23 Apr 2019. http://gameo.org/index.php?title=Indian_Industrial_School_(Halstead,_Kansas,_USA)&oldid=92091. Krahn, Cornelius. (1958). Indian Industrial School (Halstead, Kansas, USA). Global Anabaptist Mennonite Encyclopedia Online. Retrieved 23 April 2019, from http://gameo.org/index.php?title=Indian_Industrial_School_(Halstead,_Kansas,_USA)&oldid=92091.